4" Beautiful Rustic Black Slate Round Coaster Set of Four Slate Round Slabs Disc. 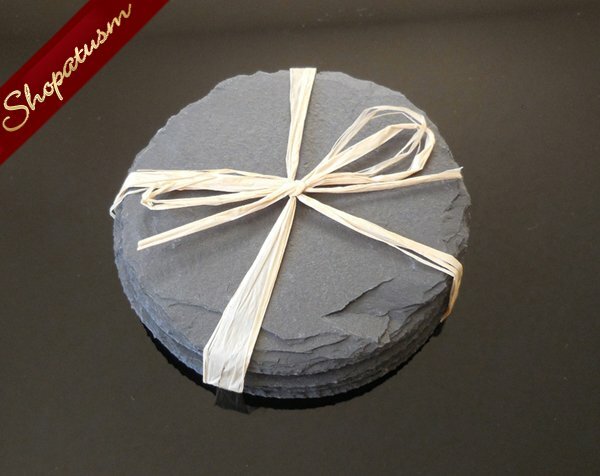 These beautiful rustic-style black slate coasters are 4" in diameter. These black slate coasters are large enough to accommodate even large drink ware, like beer mugs. Great for restaurant and upcoming events such as weddings or parties, party favors or gift set for friends and loved ones. Each coaster comes with anti-slip backing to shield furniture and delicate tabletops. 4 piece set. Please note.. slate may have slight imperfections, which is a natural part of the stone's beauty.